Unlike some religions Judaism does not seek converts. Indeed, conversion to Judaism can be quite difficult and require one, two, three, or more years of study and hands-on learning; in some cases it also costs a lot of money. There are several reasons why the rabbis have chosen to make conversion so difficult, here is one reason we seldom think about. How the Golden Rule can be applied to inter-religious dialogue and mutual respect. If only the world followed this rule how better our lives would be! Jews strongly disapprove of all missionary work. Since we find attempts to convert us so onerous and offensive, we do not seek to convert others. In this way our views are consistent with the Golden Rule. We do not do to others what we find objectionable to ourselves. From the positive perspective, we allow others to determine their religious beliefs as we wish they would leave us alone to determine our Path as Jews. "What person is there among you that if his son asks for a loaf of bread will give him a stone?" Or if he asks a fish, will he give him a snake? If you then, being imperfect, know how to give good gifts to your children, how much more will your Father in Heaven give good things to those who ask Him? Therefore all things that you desire that others would do to you, do you even so to them; for this is the Law and the Prophets -- Matthew 7:9-12. While Jews are born into our Covenant with God, Christians believe they must choose to enter into their religion. They believe that if their children do not "receive Jesus" they are doomed to Hell where the God of Love will give them over to the Greek god Hades (Lucifer) to torture them for all eternity. Details of how this conversion to Jesus is supposedly done vary denomination by denomination. Because of this belief, most religious Christians insist that if they did not already "know Jesus" they would want someone to tell them, to warn them, about this threat so they could avoid "Hellfire and damnation." Since they would want to be "missionized" they understandably offer this choice to others. They are therefore obeying the Golden Rule as they understand it when they try and missionize us. You do not need to missionize us according to the Bible! "They shall be My people, and I will be their God. And I will make an everlasting covenant with them, that I will not turn away from them, to do them good; but I will put My fear in their hearts, that they shall not depart from Me." "Yes indeed! I tell you that until heaven and earth pass away, not so much as a yud or a stroke will pass from the Torah -- not until everything that must happen has happened... Matthew 5:18; Complete Jewish Bible, by David Stern. "Now the people here [i.e. in Berea] were of nobler character than the ones in Thessalonica; they eagerly welcomed the message [i.e. of the followers of Jesus/Yeshua], checking the Tanach every day to see if the things Sha'ul [i.e. Paul] was saying were true...." Acts 17:11; Complete Jewish Bible. "You people don't know what you are worshipping; we worship what we do know, because salvation comes from the Jews," Jesus/Yeshua at John 4:22; Complete Jewish Bible. 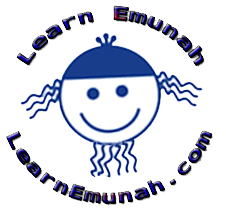 "Then Yeshua addressed the crowds and his talmidim: "The Torah-teachers and the P'rushim [i.e. the rabbis]" he said, "sit in the seat [i.e. hold the authority] of Moshe..." Matthew 23:2; Complete Jewish Bible. "In that case, I say, isn't it that God has repudiated his people?" Heaven forbid! For I myself am a son of Y'israel, from the seed of Avraham, of the tribe of Binyamin. God has not repudiated his people, whom he chose in advance; Romans 11:1,2; Complete Jewish Bible. So, can the conversion rift be resolved between us without compromising the Christian understanding of the Golden Rule? YES! Please consider my Christian friend: If you were part of the Eternal Covenant described in the Torah would you want people trying to convert you away from it as the Baal worshipers and so many others sought to do throughout the centuries? Of course you wouldn't! Such attempts would offend you as they offend us. Therefore, please go after the other nations if you wish, but leave us aloneWe hold the eternal Covenant of HaShem! You do not need to missionize us according to the Bible you claim to belive in! May I Suggest: Muslims For Jesus? Pretend to be Muslims the same way "Jews for Jesus" pretend to be Jewish. Infiltrate them, copy their customs, twist the words of al Qur'an so it seems to teach your beliefs. Then tell the Muslims what their book "really means." Your own holy book teaches that the Torah is eternal (Jeremiah 32:38-40) and will not be replaced nor revoked (Matthew 5:18). That all of your beliefs are to be harmonious with the Tanach and that anything that contradicts Torah is to be rejected (Acts 17:11) -- frankly, not much of what is being taught today "in Jesus' name" would be accepted based on this verse. That the Jews still maintain the truth and the way of salvation (John 4:22, Matthew 23:2). Paul says that we are still the Chosen People and that those who seek God seek to be grafted onto our 'Tree', and not the other way around (Romans 11). You are told to come to us to learn, we do not go to you. As your rabbi, Jesus/Yeshua, plainly stated the rabbis (the Jewish leaders) and other Jewish Torah teachers are authorized by HaShem to manage the authority of Torah and the Way of God originally granted to Moshe (i.e. Moses), see Matthew 23:2. 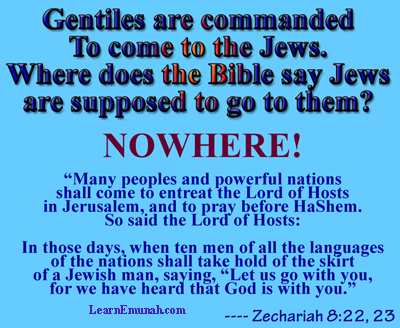 Gentiles are given that authority nowhere in the Bible and yet you seek to convert us? new things that only recently came, which your forefathers did not fear -- Deuteronomy 32:17. Our fathers did not know a triune god. They did not know a god-man named Jesus/Yeshua. Likewise they did not know Hubal-Sin, aka the allah of Islam. They did not know Muhammad, who also demands that we leave Torah for their plagiarized religious system. The God of Avraham, Isaac, Jacob, Moshe, the Rabbis, Jesus/Yeshua, the Rambam, Rashi, the BESHT, Rebbe Nachman of Breslov, the Lubavitcher Rebbes... NONE of our fathers knew any god other than HaShem, the ONE God of Israel. We Jews are their descendants and we desire to know no God other than HaShem. In Him ALONE we place our faith. Again, be our friends, do not seek to convert us! As the Rabbinic Jewish reformer Jesus/Yeshua of Nazareth plainly said: We worship what we do know, because salvation comes from the Jews" -- John 4:22. This is the whole Torah, all the rest is commentary, go and learn it." "I am HaShem, I do not change; therefore you sons of Jacob are not consumed"